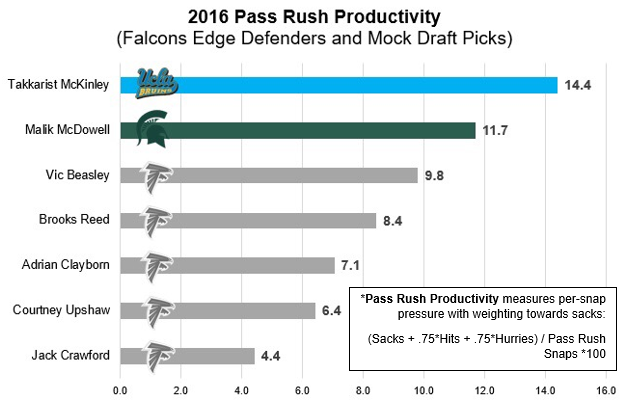 With their first two picks in PFF’s live mock draft, our writers had the Falcons selecting two edge-rushers in Michigan State’s Malik McDowell (31st overall) and UCLA’s Takkarist McKinley (63rd) to bolster their below-average pass rush. Atlanta’s most efficient pass-rusher from 2016, Dwight Freeney (pass-rush productivity of 10.1) remains a free agent. In 2016, McDowell was extremely effective at producing quick pressure, while McKinley wreaked havoc later in plays. On plays where the QB threw in under 2.5 seconds, McDowell ranked third among draft-eligible interior defenders in PRP with a 9.9 rating. On plays were the QB threw in 2.6 seconds or more, McKinley ranked fifth among draft-eligible edge defenders with a 26.2 PRP rating.